What does it take to succeed as an artist? Talent. Persistence. Consistency. And business acumen. 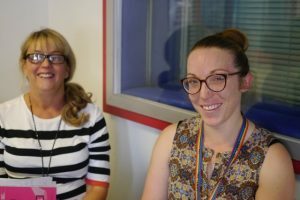 My latest Business Live radio show, broadcast on Sheffield Live! FM radio on Friday and available as a podcast below, examined the commercial perspective of working as an artist. 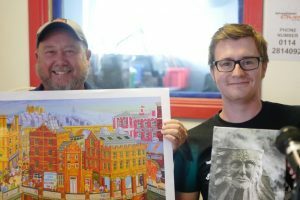 Tom Vickers of Stoneface Creative and businessman and mentor, Steve Eyre (who runs World of Superheroes) joined me in the studio to give their advice. Tom’s father, Andrew Vickers, produces acclaimed work now being sought after by high profile entertainment and business figures. Steve’s made his share of business successes and investments, and has a passion for comics and superheroes. He now mentors artists and unveiled exciting news about internationally-recognised artist Joe Scarborough during the programme. Tom and Steve covered partnerships, profile-raising and much more, and how commercial support can free up an artist to do more of what they love most. Also on the show: business as a force for good and corporate social responsibility (CSR). Carolynn’s enjoyment of her role is so evident, it is infectious. She introduced the Trading for Good website and her approach to partnership-building. Kate explained why Irwin Mitchell engage in CSR and their four-pronged approach. Does the work they do align with existing needs which have already been identified? Who do they work with, and why? Find out in the podcast! I also quizzed Kate about whether CSR has been devalued or is “greenwash” to make firms look good, so if you’re sceptical about CSR in 2018, do have a listen. And we heard about a collaborative and open initiative, the Responsible Business Forum in Sheffield. 0 – 4:52 introduction and updates: Sheffield-based Twinkl announce partnership with BBC Children in Need; SCX ready to raise the roof on No.1 Court; get in touch. 4:52 – 28:30 Steve Eyre, World of Superheroes and Tom Vickers, Stoneface Creative. 51:48 – wrapping up – forthcoming events Tramlines and Pride Sheffield. Check out Stoneface Creative’s website and find them on twitter. Visit World of Superheroes (new website will launch on 1 September).